I still haven't finished Black Science and I'm episodes behind on The Expanse. (I know this is a post about Joyride but give me a moment) All this to say that I'm currently missing out on my required amount of space, science fiction, action adventure stories. Good thing I stumble across all three collected volumes of Joyride at my local library. 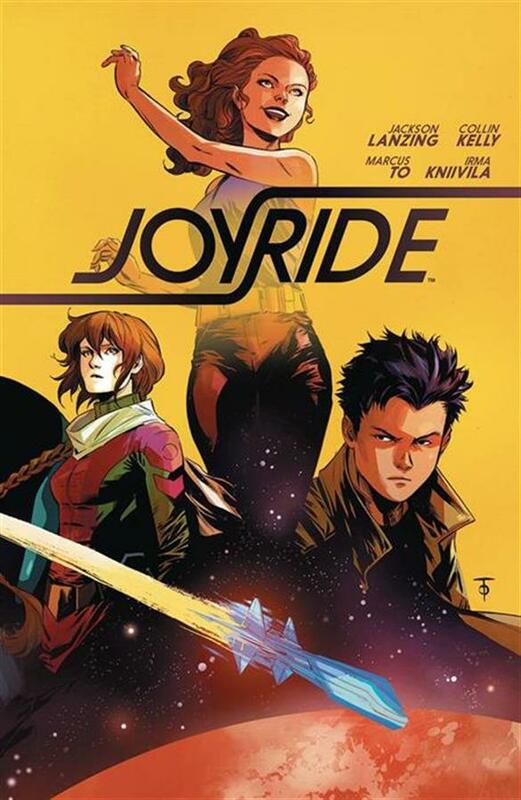 I had read the first two issues before but in this current growing and never ending stream of content, Joyride was lost in the shuffle. From what I recalled it was an interesting beginning to a story by the team behind the Hacktivist comic book series with Alyssa Milano. I saw it in the library and knew it would give me something to read on my commute to and from work. 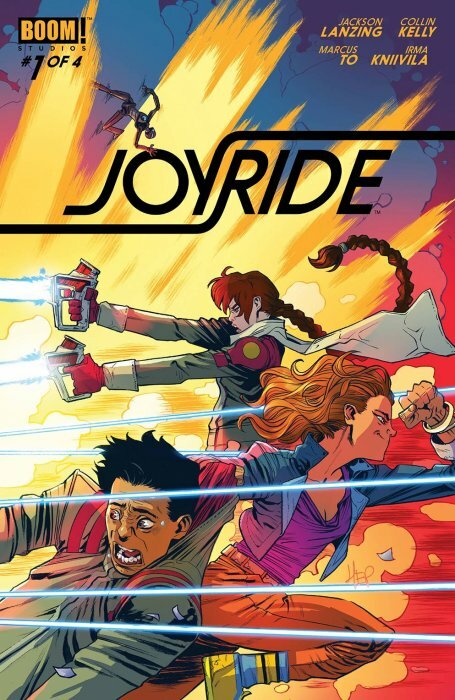 Joyride is an engaging story about three young people living on a future Earth. The Earth in this future reality is ruled by a single world government and the planet is covered by a shield to protect it from outside forces. Additionally, there is a giant laser cannon on the Moon pointed at Earth. This cannon is used to target dissident factions who are in opposition to the fascist regime in charge. These factions are called the Akkolytes and the character that jump starts this adventure past the shield into unknown space is one of them named Uma. She is joined on this mission by her friend Dewydd Abderizai, a low-level technician who is also a hero for the government of Earth which Uma doesn't know. They end up on a ship that Uma arranged with a young woman who is trying to apprehend them named Catrin, who has her own secrets as well. Soon, they take over the alien vessel and pick up allies along the way as they mature and learn who they truly are. More importantly I think they begin to accept their flaws and strengths and use them to not only fix their lives but the universe as well. Joyride starts out small, or as small as a story about adventures and hi-jinks on a spaceship exploring planets can get. The adventures expand and grow larger and the stakes become graver as the story moves along. The three Earthling encounter aliens and new ideas beyond what they learned while sheltered on Earth. 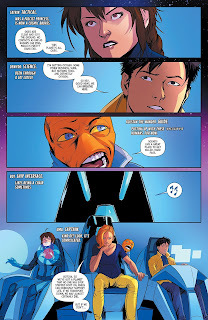 What is really compelling about this series is that despite the things that they are doing becoming galactic in nature the characters are still young people doing things that other young people would do in regular life. Their reactions read as accurate. Their emotions are very open and even when they do things that are ill advised, they are mostly likable. The mistakes and decisions they make are understandable for anyone who has ever been young and rambunctious. Or if you have never behaved this way when younger, you are given enough information about the three protagonists and the folks they encounter to understand why they do the things they do, even the "bad guys." Accurate portrayal of this book's action. Joyride is exactly what it title says- a joyride. These are kids getting their hands on a vehicle they shouldn't have and letting the (space) road take them to whatever is next. This series is the coming of age, leaving your hometown, learning about yourself story writ large and in galactic font. It's a fun ride and I would recommend you give it a read when you get a chance. In this current world we all need a break to remember how fun the unknown can be.